The Gohorn Military was designed to strike fear into their enemies; the presence of the large gun turrets is enough to make most crewmembers think twice before committing themselves to engage. The Gohorn Directorate spends over 70% of its resources on maintaining its military. The military structure itself is of huge proportions, with classes and divisions within divisions. The sheer size and clout of the military has made it a government in its own right. The military is responsible for fighting wars, but it is also the sole investigative body of the Gohorn Directorate. There is no independent police force; instead the military takes care of all criminal issues as well. The name for the police department of the military is the Taretmak. 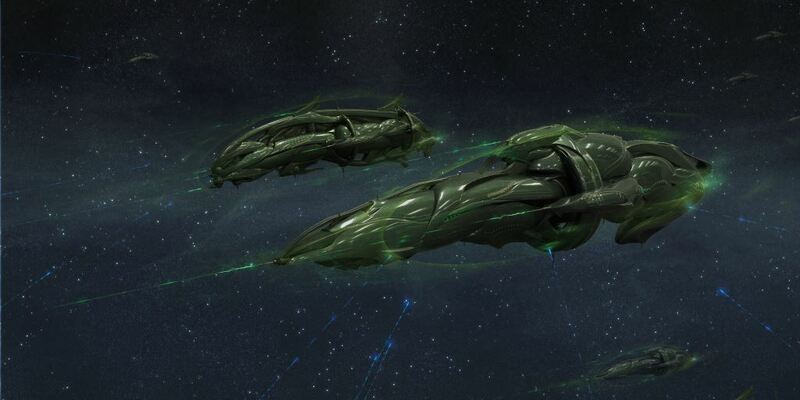 The Gohorn Directorate's ground and space support crafts were designed to (like their starships) strike fear into their enemy's heart without even firing a shot. In order to accomplish this, the Gohorn Directorate building their vehicles big and often clustered with as many gun ports as is reasonable without hampering the operations of the vehicles. The Gohorn Directorate's ground forces are often amply protected by hover tanks that are equally excellent missile launchers (whether that is against ground or air objectives). This equipment has made the Gohorns quite capable on ground, and combined with their excellence as warriors, has made them one of the most feared ground force that ever existed. In space, however, Gohorn Fightercraft have yet to show themselves as equal to their Terran and Rosebourg counterparts - the Gohorns are still learning how to make their Fightercraft less bulky, more manoeuvrable. The Heads of the Armed Forces are the third most powerful people in the Directorate next to the Chief and Regent Admirals within their sphere of influence, though the Heads of the Armed Forces have better interaction with the Chief. These individuals hold enormous power over the people of the Directorate. These individuals are incredibly important advisors to the Chief and are often responsible for coordinating almost the entire war-effort within their respective departments. Loyalty to these warriors is supreme. The rules of engagement for the Gohorn Directorate are incredibly precise, containing a strictness born out of the Gohorns' reverential approach to battle and the art of war. Called "The Fed'Krelek" Gohorn rules of engagement detail the entire scope and purview of a warrior in the thick of combat. The document is highly regarded by the warriors of the Directorate as a necessary tool to contain battle to the objectives, and not have it spill over in to general violence. Gohorn Military Academy, Helkatan, is the finishing school for all citizens of the Gohorn Directorate. Since military service is compulsory every male and female will go through the two year training course of the Academy, before their compulsory fifteen year military service. All Gohorns are given advanced combat training, and after the first year are assigned to their branch of the military based upon where their skills lie - Remteklar, Velakor or Dedareten. Discipline in the Academy is brutal and conditions many Gohorn soldiers in to the expert warriors that they are on the battlefield. Intelligence apparatus for the Gohorn Directorate, the Dedareten are both the external and internal security agency for the Directorate. Headed by Coordinator Larsha, the Dedareten are a small group of soldiers who are given absolute authority by the Chief of the Directorate. Only a member of the Admiralty is not under the scrutiny of the Dedareten, who operate without impunity throughout the Directorate. As far as Gohorns feel fear, that is what they experience for the internal security wing. Externally, the Dedareten rely on sting operations to capture enemy officials and then interrogate them. Highly skilled in interrogation because Gohorns make for bad operatives within other governments, the Dedareten are renowned for their ability to extract information from anyone. In so far as they need to use operatives to infiltrate the Terran Democratic Republic, surgically altered and loyalty tested Declothans are sent in. The Taretmak is oftentimes made up of older soldiers who have served their 15 years in the Velakor or Remteklar and wish to transfer. Though it is the civil law enforcement division of the Gohorn Directorate, it still falls under the rank structure and jurisdiction of the military, just like most industries within the Directorate. Taretmak officers are tasked with solving civil crimes, murder, theft, fraud; the kind of crimes which the military is not set up to deal with.